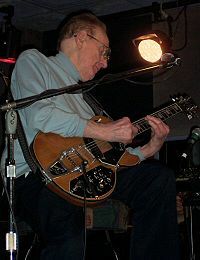 Les Paul ag seinm an ghiotáir sa bhliain 2004. Ceoltóir, ceapadóir agus ceannródaí giotáir ab ea Lester William Polsfuss (9 Meitheamh, 1915 — 13 Lúnasa, 2009) nó Les Paul mar a bhí aithne níos fearr air. Meiriceánach a bhí ann, bhí páirt lárnach aige i bhforbairt an ghiotáir leictrigh agus tá ceann de na giotáir is cáiliúla ar domhain ainmnithe in ómós dó, an Gibson Les Paul. Giotáraí an-chumasach ab ea é chomh maith, a d´fhág a rian go soiléir ar na glúine a tháinig ina dhiaidh. Tugadh an leathanach seo cothrom le dáta an 16 Meitheamh 2017 ag 21:02.